One of the best desktop preamps we've ever used - and one of the year's best bargains. Ideal for home and project studios. Great value for money. Extremely versatile. Excellent sounds. 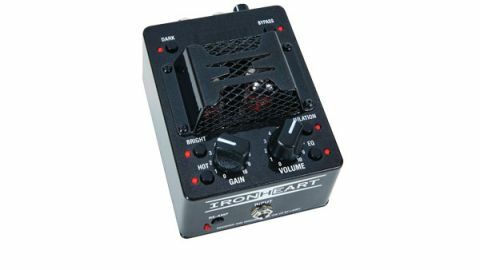 The innovative IRT range has captured many players' imaginations, with features that often work as well at home or in the studio as they do on stage. The range includes combos, heads, and an awesome specialist recording head called the IRT-Studio, which blew us away when we first tried it back in 2013. Now, Laney has distilled the IRT-Studio into a conveniently sized desktop preamp and recording tool with a host of other potential uses: meet the IRT-Pulse. "Sounds are highly customisable, and very, very good - crystalline cleans to sweet funk, classic rock and blues to searing, modern metal"
First appearances can be deceptive: the IRT-Pulse is definitely not just another 'black box' foot pedal; look closer, and you'll notice the Pulse's enclosure is actually a trapezoid, finished in metallic charcoal with a black-on- black Laney logo. Plug it in, and not only do the status LEDs glow red, but the valves do, too, illuminated from below. Three more LEDs buried in the base provide a subtle red glow, giving the impression the Pulse is almost hovering over the desk, rather than sat on it. The key selling point of the Pulse is its USB output, which provides zero-latency recording into your choice of Windows or Mac-based DAW. As well as being able to record via USB, there's also a very useful re-amping feature, which lets you take a dry, un-effected guitar part, process it through the Pulse and simultaneously re-record it, providing endless opportunities for tweaking your guitar tone to perfection. The Pulse also features speaker emulation and a balanced line out for connection direct to a desk, and an auxiliary in. There's a headphone output with level control, three tone presets (dark, bright and EQ), rotary controls for gain and volume, plus a properly buffered bypass. You can use all these features in a variety of scenarios: as a standalone preamp with your mp3 player playing your backing tracks, or as a valve enhancer in the loop of a solid-state product, putting in some extra warmth and dynamic range, or as an extremely potent valve overdrive pedal with four cascaded valve gain stages, and a very useful remote footswitch to operate the fully buffered bypass. Sounds are highly customisable, and very, very good - crystalline cleans to sweet funk, classic rock and blues to searing, modern metal. The noise floor is very acceptable, with just a little high-gain hiss: well up to top-level recording standards. There's no doubt Laney's game has been substantially raised in recent years, and the IRT-Pulse is one of the best desktop preamps we've ever used - it's ideal for home and project studios, while doubling as an indispensable tool for live shows, thanks to the remote footswitch jack. Best of all, this versatility can be had for just under two hundred quid.